Today is Pancake Day in the Oh Waily household. It’s one of our family traditions. Our pancakes are normally of the round and crêpe-like variety. This works really well for kids who like to smear golden syrup over them and roll them up or if you are like Miss Oh Waily and sprinkle sugar over the top with a drizzle of lemon juice to finish. This morning we broke the habit and moved on to more artistic variations. This is what we had for breakfast this morning. 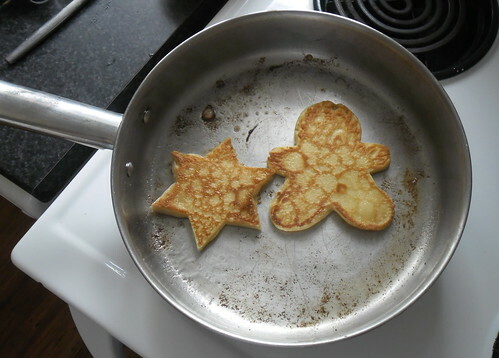 Awesome, creative pancakes…I like it! Problem is not enough jam and cream will fit on that shape!